Easy to wear low slides are a modern staple shoe to complete any shoe lover's closet. Made from vegan faux suede and a manmade synthetic outsole, you can strut in confidence. You can't go wrong with Monzi Sandals by J. Adams! ADD A BOW OR SOME FUR! : The Monzi Bow and Monzi Fur by J. Adams are the new modern slip-ons that reflect your most excellent and personal style. The Unique high quality ribbon or soft faux fur will makes these slides stand out from other boring slip ons. FUNCTIONAL SLIP ONS: We love slip ons all day long. A comfortable footbed is perfect for a quick run around town. 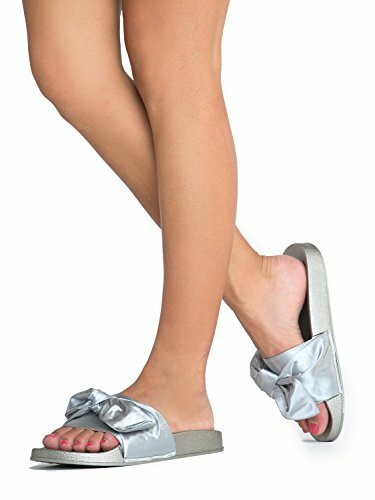 Monzi Bow is designed to slip on and off with ease! Designer inspired sandals are a practical addition featuring a soft upper knot and sturdy footbed, ensuring maximum comfort. COMFORTABLE ALTERNATIVE: Give your heels a break! Versatile slip on shoes are a classic when it comes to styling. Stand out by rocking these trendy and cool sandals with shorts or white denim! MEASUREMENTS: Heel 1". FIT: Runs small. Please Order 1 size up.